★https://youtu.be/WLciFLqAvgs [HIGH SENSITIVE]: Long and short metal buttons, six finger linkage buttons are more rapid to fire. Hyper Sensitivity, capactive sensors bring better sensitivity, doesn't need Bluetooth, cables or any connectors, just clamp and play, point and shoot faster than ever. ★ [HOW TO USE ] Before playing game, customize your shoot and aim buttons under the touch pad of the cell phone game controller. 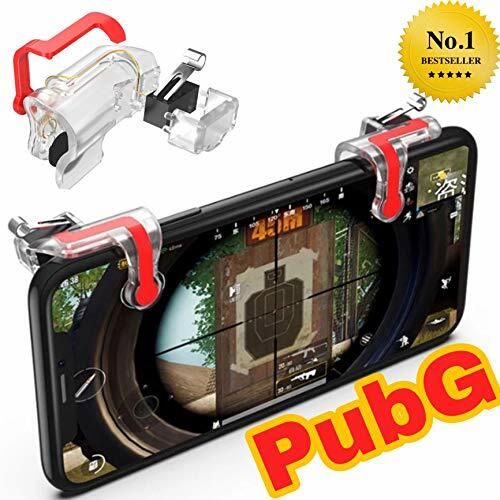 ★ [SUPPORTED DEVICES] The mobile game controller supports many video games on android or IOS mobile phones, and our mobile game triggers are perfectly compatible with shooting games, including PUBG, Fornite, Rules of Survival, Knives Out, Survivor Royal, Critical Ops, etc.